My post today is to tell you a little bit about stamping companies that make scenic stamps. When I was first introduced to scenic stamping there were only a few stamps from A Stamp In The Hand (designed by Kevin). Then my mom and I found Art Impressions. We fell in love with their sectional seascape pieces and their "front n back" stamps. Kevin started his Stampscapes company in the early 90's and really made the scenic stamping art what it is today. Since then, many more companies have designed a line of scenic stamps for us to enjoy. The design team has suggested a number of companies that I placed on a new tab at the top of the blog called "Scenic Stamps". In there you will find a link to their stamping store, their logo and a little bit about what they offer. I will continue to add companies as I find them. If you know of any, please email me and I will happily add them to the list for all of us to enjoy. I couldn't help checking out all those companies that were new to me and of course I had to buy some new stamps. Here is a card that I made this week using my new stamps from Beeswax and Sutter Stamps. Hop over to Crafting Passions to find our how I made this card and what stamps I used. There is still time to enter our challenge this month. You may link up your card or project by 6:00 PM Friday, Pacific Time. The winner and top 3 will be announced with our post on Sunday, Jan 29th. Thanks for stopping by. 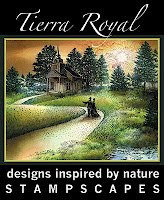 Don't forget to check out all the great stamp companies in the new tab - Scenic Stamps. Great card. The wolves look like they might just step out of the page so realistic. What a beautiful scene...the wolfs are beautiful and I love the background you created for them!!! Stunning card, beautiful scene, this is just so pretty. Well done Nancy! LOVE your new stamps and your colouring on this scene is fabulous! Gorgeous card. I really like the colouring of the mountains.